We love the personalized care we receive at PurePediatrics! Everyone is so friendly and we never feel rushed. There is always time for all our questions plus we are given information each visit we didn’t even know we needed! One of the greatest benefits is the doctor is always available if we have any concerns during non business hours. We feel 100% confident our daughter is getting the best care and being first time parents that’s important to us. Dr. Alana sits and talks at each monthly appointment. When we have questions we just get on the OhMD App and ask - we know when to come in and when to stay home and let our little one sleep - we can't place a price on that! At Pure Pediatrics I love the personal attention my family receives. It actually feels like my doctor cares about my child’s health, and his growth and development. Dr. Alana makes you feel at ease and comfortable with her knowledge and expertise. I would highly recommend her to anyone looking for a pediatrician! Dr. Alana is great! We love the monthly membership option and the unlimited access with our membership. She's able to spend a good hour with us at each visit, and we never feel rushed. She's thorough and does a great job explaining things. We also love that she is open to natural parenting and always recommends healthy diet options for kiddos, rather than going straight to medication for issues or processed, "easy" foods when discussing diet. She's a great fit for our holistic family! Dr. Alana and her staff are great! Dr. Alana is very knowledgeable and you can see she cares about the kids. Also, Destiny has an awesome attitude and makes it a breeze for my baby to get the shots. We always leave with a smile. Perfect team. I like the friendly staff and the quality of care we get. Because of the knowledgeable and professional Dr. Alana and her Consierge service. Easy access to Dr. Alana with prompt responses. Very friendly staff and spends appropriate amount of time with your child and you as parents. Always accessible. Easy to contact. Reasonable and logical care proposed by Dr, and worked with any concerns we had. Highly recommend Pure Pediatrics. It’s a friendly and very educational experience in every visit. We also love the flexibility of Dr. Alana and the time she gives to her patients. Dr Alana is always super friendly and full of very helpful information. She doesnt just tell you what is wrong with baby and send you off with a prescription, she tells you all you need to know about what is happening to baby, how to make baby happy, and offers several solutions to the problem so you can make a decision. She even fills you in on recent trends and let's you know what things you should be looking out for. Her staff is always welcoming and also full of great information. Everyone in the office has given our baby 100% of thier attention while we are there and we do not feel like just another patient. And you won't find a waiting room full of sick kids, when you have an appointment, it's just you and them. And when there was an emergency, we were able to facetime with Dr Alana and she diagnosed and offered a few solutions that worked to helps us fix baby until we could get to her office. We feel really comfortable with Dr Alana and her staff, and look forward to a long relationship with them. 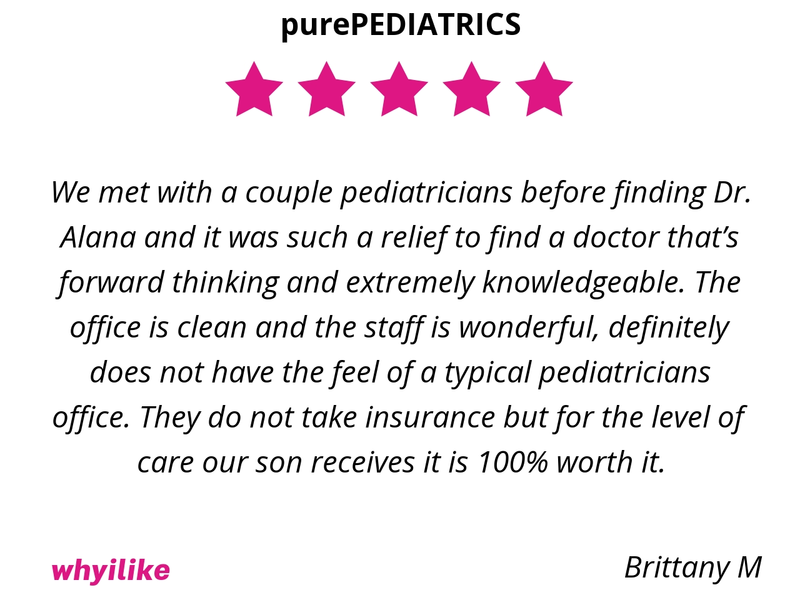 We met with a couple pediatricians before finding Dr. Alana and it was such a relief to find a doctor that’s forward thinking and extremely knowledgeable. The office is clean and the staff is wonderful, definitely does not have the feel of a typical pediatricians office. They do not take insurance but for the level of care our son receives it is 100% worth it. Dr. Alana is the best! No waiting! Knowledge and personable Doctor. Caring staff. No waiting. Clean and comfortable office. Dr. Alana never makes you feel rushed. Great experience! Dr. Alana and her staff were so wonderful!! It was a great experience. My kids have never had such a thorough examination! They also helped put this momma’s mind at ease. 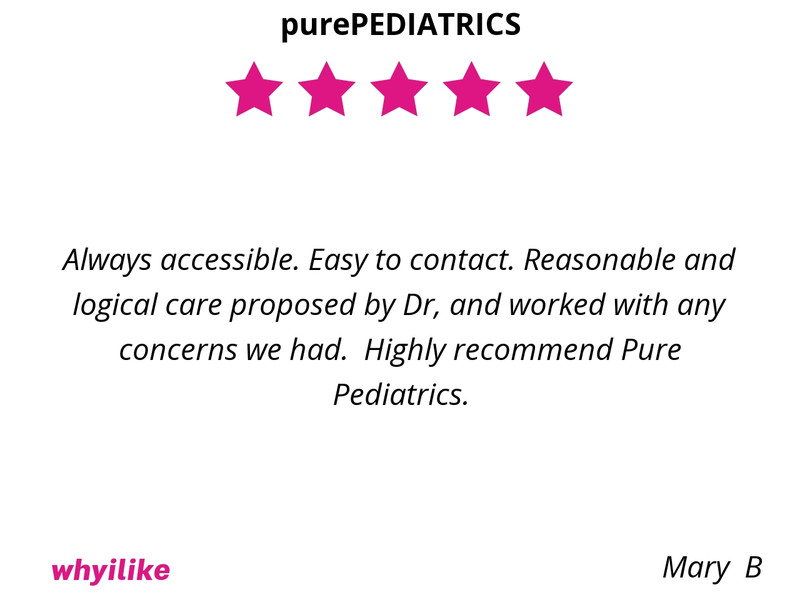 I would recommend Pure Pediatrics to everyone! We tried 2 different doctors before signing up with Dr. Alana. PurePEDIATRICS is a whole different experience - top notch customer service, friendly staff, nice & clean office.